This is commonly held to be the third most-often-played song in the United States, after “The Star-Spangled Banner” and “Happy Birthday to You”. The words were written in 1908 by Jack Norworth, who while riding a subway train was inspired by a sign that said “Baseball Today — Polo Grounds”. The words were set to music by Albert Von Tilzer. The song was first sung by Norworth's wife Nora Bayes and popularized by various vaudeville acts. With the sale of so many records, sheet music, and piano rolls, the song became one of the most popular hits of 1908. 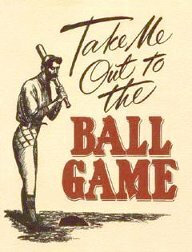 In the United States the song has become the unofficial anthem of baseball, although neither of its authors had attended a game prior to writing the song: Norworth and Von Tilzer saw their first Major League Baseball games 32 and 20 years later, respectively. For those who don't know, the song is traditionally sung during the seventh-inning stretch of a baseball game, and fans are encouraged to sing along.